The bands' co-headlining run continues through October. Journey guitarist Neal Schon gives us an exclusive sneak peek of his upcoming Custom IHush Lady M guitar. 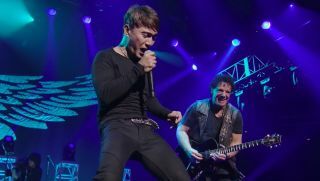 On April 7, Journey were among the honorees at the Rock andRoll Hall of Fame's32nd annual induction ceremony at Barclays Centerin Brooklyn, New York.